As the sun shines down on the hottest day of 2018 so far in the UK (24 Deg C in Bristol, 29 deg C in London - allegedly), this old pic popped up on my screen saver (Gretel in her pre-accident livery) and I couldn't resist sharing my warped sense of humour. I got a puncture on the ride home - which probably served me right for being such a rebel!! Is it a double negative? 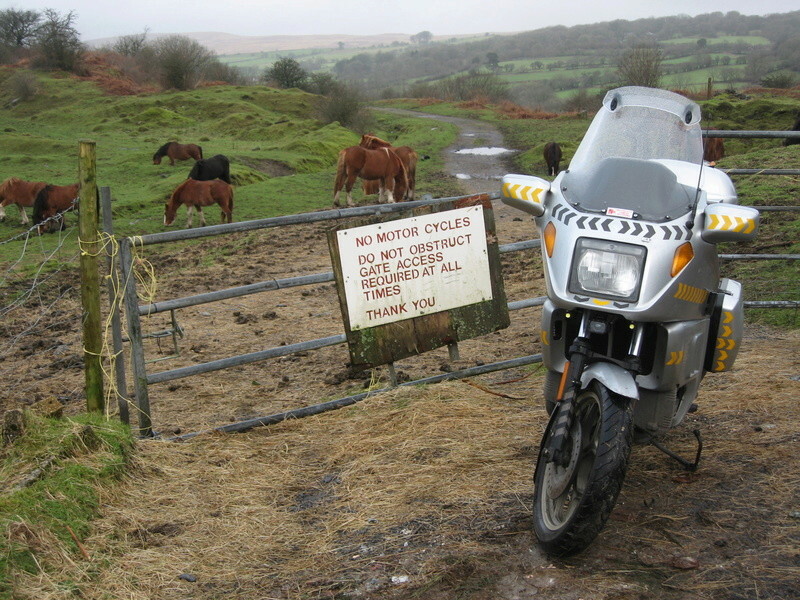 "No motor cycles do not obstruct gate..." - does that mean that motor cycles do obstruct gate? Well I was obstructing it with a motor cycle (albeit only for the sake of taking the pic), so think I was right....then again maybe I've boiled my head on the ride home today and better go and have a therapeutic coldie! Motorcycles should be one word, not two. I am driving to Montreal tomorrow and for the 1250 kms trip, it will be a mix of rain and snow. At one point I was considering going with the sidecar, but safety overruled over K-Pox. I am taking my gears with me and expect to use my bro new R1200rt. All for the want of a little comma eh.